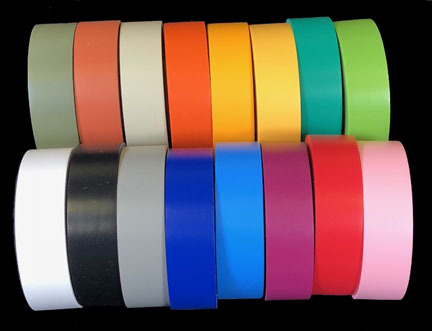 VINYL COLOR CODING & HARNESS TAPE - 16 colors are available in this high quality adhesive 5-mil vinyl tape. It comes in 3/4" wide by 66-foot long rolls on 1-1/2" diameter cores. It's conformable and temperature rated to 221ºF (but we have tested it to 290ºF). This tape is compliant with both CPSIA and RoHS standards that limit concentrations of phthalates, lead, mercury, and other heavy metals in vinyl products that are made for children. Applications include color-coding of glassware and equipment at hospitals, laboratories (it's autoclave proof), food service facilities (withstands commercial dishwashing), dance & exercise hoops, and children's lunch and snack containers, bottles, and utensils for school and daycare. It's primary use is as wire harnessing tape in the automobile, aircraft, and aerospace industries. 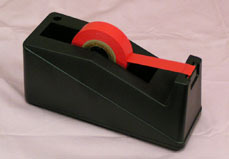 It meets GM/Packard Electric Division engineering specs ESM-4037, DIN 40633, and most European, US, and Japanese specifications for color coding tapes. Available below as individual rolls, 16-roll Multi-Color packs, and 208-roll cartons (at a discount).